I am not the biggest fan of books comprised merely of compilations of short stories written by different authors. Most of these books seem to offer a mishmash of writing styles and story ideas, taking the reader all over the place. 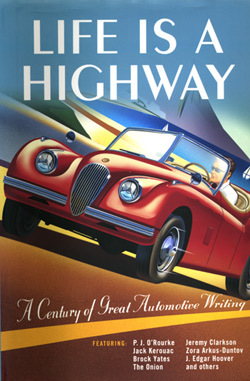 But, that is precisely the charm found in “Life Is A Highway,” a book that pulls together a century of great automotive writing as compiled by its title curators, Darwin Holmstrom and Melinda Keefe. By perusing this book you can absorb 46 diverse automotive stories spanning the earliest days of the auto industry until now. Life Is A Highway (MBI Publishing Company, $25) will most certainly appeal to the journalist who will instantly recognize some of their peers in print. Car enthusiasts should find the book enjoyable with sections devoted to articles about dream cars and racing. And, if you are someone who is interested in the auto industry from a historical perspective, then you’ll learn that good tires, child safety and gas mileage have been consumer concerns for many years. Among the most recognized writers featured are P.J. O’Rourke, Jeremy Clarkson, Peter M. Di Lorenzo, David E. Davis and Brock Yates. Jay Leno, J. Edgar Hoover and Alfred P. Sloan, Jr. are also included as are a number of writers who have long passed on and may be known only to a few. And, no compilation would be complete without a chapter of Stephen King’s nightmarish “Christine” included. Even “The Onion” is given room to offer its satirical perspective on our car culture. Great writing? Yes, from a truly sidesplitting angle. You would think that a Ferrari Daytona would win a coast-to-coast race with ease, right? Well, that wasn’t the case with the 1971 outlaw Cannonball race, one of several New York to L.A. events held during the 1970s. Dan Gurney and Brock Yates were the team taking turns piloting this Sunoco blue Italian steed, winning the race in just under 36 hours. Amazingly, it was three people in a Cadillac who nearly beat the Ferrari. With the help of a Dodge patrol car intercepting and ticketing the winners at speeds topping 140 mph, a delay that nearly cost the Ferrari team first place. That story, “1971: The Race That Shook The World,” was penned by Yates. Foreign cars were few and far between in the 1950s, but Jane R. Bade and her husband Tom owned a Volkswagen Beetle in 1955. Loved by Bade from the start, this young mother of two tots shared her family’s adventures in “A Fiend Goes Foreign.” It seems Bade was married to a car nut or serial car owner, a guy who purchased, drove and sold cars almost as fast as a used car salesman. A totally impractical vehicle for a family of four with a dog and the usual kid stuff to carry, Bade recounts riding in a car that was laughed at, had mechanical problems, but nonetheless caused her to fall head over heels for this economical, foreign ride. Jamie Kitman, former New York bureau chief for Automotive Magazine, took General Motors, the Ford Motor Company and Chrysler to task in “Noise, Vibration and Harshness: The Big Three American Automobile Companies.” Published just prior to the economic collapse of September 2008, Kitman outlines what he calls a “paradigm shift”in the auto industry with the domestic makes collapsing and foreign brands figuring out what people want to buy and building the better vehicles. Though this article doesn’t have the hindsight of GM and Chrysler passing through bankruptcy and emerging as different companies, you have to believe that this same historical shift will keep the Big Three from ever returning to its mismanagement ways. What would you do if you got a once-every-five-year opportunity to drive a Ferrari Testarossa and snow was in the forecast? If you were living in southeast Michigan and your name was Jean Lindamood (Jennings), you would scrap plans to drive south through Ohio where the storms were raging and do the unthinkable: invite 49 friends along for a ride. That’s precisely how Lindamood made the most of her time with a Ferrari by staying local and surprising former co-workers, a crotchecy old lady and pimple-faced teens with a chance to ride while she drove. “A Ferrari Among Friends” shows how an exotic car can bring out the best in people. As I was reading “Life Is A Highway,” I found myself recalling several almost forgotten cars and the crazy rides I’ve taken down through the years, imagining myself penning a story or two of my own. Those tales remain locked deep within me for now, but bubbled to the surface as I absorbed each story. Likely, you have your own untold stories buried just beneath the surface, something dozens of master writers are just waiting to help you rekindle in Life Is A Highway.